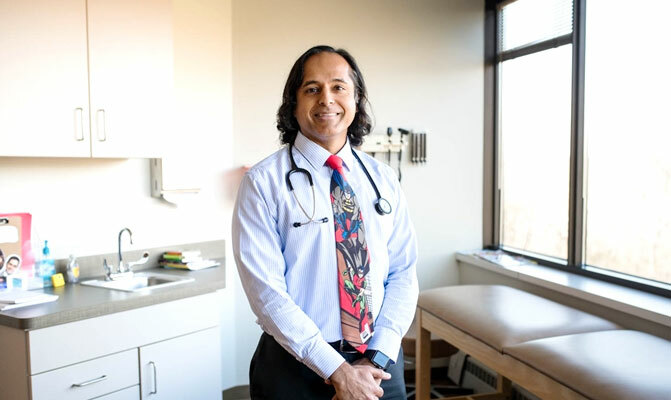 Dr. Warrier practices at the Allergy, Asthma & Food Allergy Centers of St. Louis (formerly Allergy, Asthma & Sinus Care Center), specializing in the treatment of children and adults with allergies, asthma, and immune deficiencies. Prior to joining the Allergy, Asthma & Sinus Care Center in 2008, he was on faculty at the Cincinnati Children’s Hospital Medical Center in the Division of Allergy and Immunology. Dr. Warrier is currently certified by the American Board of Allergy and Immunology. He has also passed certification exams from the American Board of Internal Medicine and the American Board of Pediatrics. He has been an invited speaker for American Academy of Allergy, Asthma & Immunology (AAAAI) and Continuing Medical Education meetings and was twice been awarded the Outstanding Junior Faculty Pediatric Abstract Award presented by the American Academy of Pediatrics Section of Allergy and Immunology at the AAAAI. He has coauthored several papers, including studies on food allergy -“The Prevalence, Severity, and Distribution of Childhood Food Allergy in the United States” published in Pediatrics in 2011 (the often quoted 1 in 13 children are affected by food allergies comes from this paper) and “Parent Report of Physician Diagnosis in Pediatric Food Allergy” published in the Journal of Allergy and Clinical Immunology in 2012. He is passionate about food allergies, since his older daughter suffers from peanut, tree nut, and chickpea food allergies, but we are happy to report that his daughter has graduated from OIT (oral immunotherapy)/desensitization for peanut (so now eats them regularly) and is currently on OIT for tree nuts. He is actively involved in the Internal Medicine Residency Training Program at SSM St. Mary’s Health Center, Mercy Hospital Residents, and the Allergy Immunology Fellowship Program at St. Louis University. Dr. Warrier is a Clinical Associate Professor in the Division of Allergy and Immunology at St. Louis University.